Be the first to share your favorite memory, photo or story of Maggie Edith . This memorial page is dedicated for family, friends and future generations to celebrate the life of their loved one. 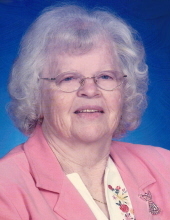 Mrs. Maggie Edith Jennings Church, age 82 of North Wilkesboro, passed away Thursday, April 4, 2019 at Wilkes Senior Village. Funeral services will be held 2:00 PM Sunday, April 7, 2019 at Cricket Baptist Church with Rev. Greg Hall and Rev. James Wingler officiating. Burial will be in Hilltop Baptist Church cemetery. The family will receive friends from 1:00 until 2:00 prior to the service at Cricket Baptist Church. Mrs. Church was born July 14, 1936 in Wilkes County to Ernest Jennings and wife Maggie Ann Hutchinson Jennings. She was retired from Holly Farms/Tyson Foods after 40 years of service. Mrs. Church was a member of Cricket Baptist Church. She enjoyed crocheting, knitting, and the company of her four loving children, numerous grandchildren and great grandchildren. In addition to her parents, she was preceded in death by four sisters; Carol Poteat, Doris Lavitich, Dorothy Fitzgerald and Evelyn Jennings and four brothers; Roy Jennings, Claude Jennings, Tommy Hutchinson, Lee Hutchinson and Jim Hutchinson. She is survived by her husband; Billy George Church of North Wilkesboro, a daughter; Tammy Bowlin and husband Randy of Millers Creek, three sons; Ricky Eller and wife Teresa of North Wilkesboro, Steve Eller and wife Junie of North Wilkesboro and Billy Church of North Wilkesboro, eight grandchildren; Casey Minton, Nevin Johnson, Kati Petrey, Lathan Church, Colton Church, Sherri Cothren, Shana Johnson, Clayton Mathis, eight great grandchildren; Beckam Minton, Barrett Minton, Erin Cothren, Paulina Johnson, Michael Johnson, Adam Mathis, Ansleigh Mathis and Jacey Cothren one great- great grandchild; Braylen Bell and a brother; Jay Jennings of Palm Beach FL. Flowers will be accepted or memorials may be made to Hilltop Baptist Cemetery Fund 161 Fairplains Road, North Wilkesboro, NC 28659. To send flowers or a remembrance gift to the family of Maggie Edith Jennings Church, please visit our Tribute Store. "Email Address" would like to share the life celebration of Maggie Edith Jennings Church. Click on the "link" to go to share a favorite memory or leave a condolence message for the family.